On 5 December 2016 the Institute for Strategic Studies ‘New Ukraine’ held a press conference entitled "Minsk-3: Public Expectations, Political Decisions, and Actions". 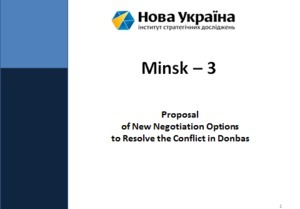 The Director of the Institute A.Yermolayev presented "Minsk-3: a Proposal of New Negotiation Options to Resolve the Conflict in Donbas". Please see his Presentation in the attachment (Pages 1 - 6). O.Levtsun, the Director of Sociological Programs of the Center for Social Studies "Sofia", presented the survey results "Public Opinion on the Causes of the Conflict in Donbas and the Perspectives of Conflict Resolution". Please see his Presentation in the attachment (Pages 7 - 12). - “Lessons from the Ukrainian Crisis: New Approaches to Security Policies (Global, National, Regional Levels)” (May 2014).